note :if you found your watch can't charge please take it out then put it inside and try again ,thank you! ✔【Stylish Design】The smartwatch phone made of Full round face 1.54 inch curved ultra HD touch screen, surface zinc alloy plating process.With the ultra-soft band, anti-sweat matte surface treatment. ✔【Rich Functions】Support Facebook, Whatsapp, Twitter, Browser (Insert SIM card and micro SD card); Self artifact, Camera, Sound Recorder, Sleep monitor, Alarm, Calendar, Calculator, Pedometer, sedentary remind, anti-lost, Audio player, Phonebook, Timezone. ✔【Independently Phone】You can operate the smart watch without a connection to another device when insert a SIM and TF card, just like a feature phone on your wrist. 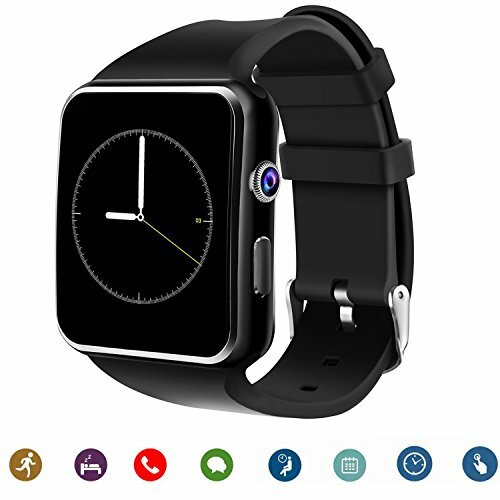 It becomes a standalone watch phone, you can send and read message, making or receive calls on your watch. ✔【Android Wear】Supports Android version 4.2 or above. All functions can be used on Android smartphone. Download the App "BT Notification" on Google Play or other Android app market. ✔【Note】 BT notification, Remote capture, BT message, Time sync and Anti-lost not support IOS smartphone, Blackberry and Windows Phone. There is no app for iphone,Blackberry and Windows Phone. Only support partial functions. If you have any questions about this product by tagobee, contact us by completing and submitting the form below. If you are looking for a specif part number, please include it with your message.